Hafiz Saeed Offers Hurricane Aid, US Says No Thanks…! The U.S. has turned down an offer of post-Hurricane Sandy assistance from one of the world’s most wanted men, a Pakistani leader with a $10 million U.S. bounty on his head. Hafiz Saeed, an Islamist militant who is alleged to have masterminded the 2008 Mumbai terror attacks that left more than 160 people dead, issued a written statement Wednesday saying his organization was willing to send supplies and volunteers to help the U.S. East Coast recover. “We are ready to send food items, medicines and doctors to the U.S. for the people affected by the storm,” said Saeed. “America [may] fix bounties on our heads but as followers of the teachings of the Prophet Mohammed (peace be upon him), we feel it is our Islamic duty to help Americans trapped in a catastrophe.” Saeed noted that the charity he heads had provided aid in Sri Lanka and Indonesia after the 2004 tsunami. 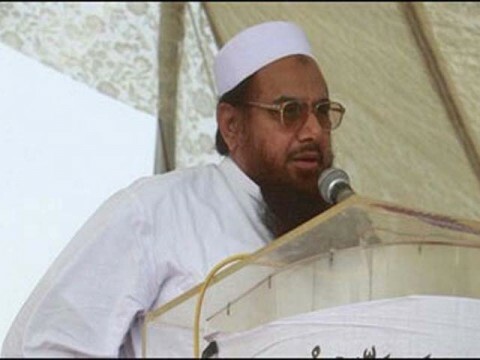 Saeed is the founder of Lashkar-e-Taiba, heads its charity wing, Jamaat ud Dawa. Earlier this year the U.S. State Department offered a $10 million reward for information leading to his capture or arrest. Saeed founded Lashkar-e-Taiba more than 25 years ago and has mounted many attacks against India as part of a campaign to wrest the Kashmir region from Indian control. Saeed is accused of masterminding the Nov. 26, 2008 terror attacks on the city of Mumbai. Ten gunmen took part in the multi-day assault, which cost the lives of at least 166 people, including six Americans. The lone surviving attacker, who faces a death penalty, has accused Saeed of hatching the plot. Saeed responded to the announcement of the bounty by publicly taunting the U.S. government. “I will be in Lahore tomorrow. America can contact me whenever it wants to,” said Saeed. He also expressed surprise that the U.S. did not know where he was, offered to face charges in an American court, and said America had “gone blind” because of its hatred of Islam. The $10 million bounty makes Saeed among the top five most-wanted on the U.S. terror list; al Qaeda leader Ayman al-Zawahiri is worth a $25 million reward. The U.S. also offered up to $2 million for information leading to the arrest and conviction of Saeed’s brother-in-law, who is the deputy leader . But above all, If Hafiz Saeed and his group has killed people, so does the great America !! We can say this now that whatever he do according to his beliefs.. MUSLIMS are always ready to help others in need… Muslims are not bad they are taught to help others from their childhood. Afterall, Helping in Caring ! This entry was posted in Current Afairs, everyday life, Uncategorized and tagged americas most wanted, compare hafiz saeed and america, film innocence, Hafiz saeed, Hafiz saeed and america, hafiz saeed killed people, hafiz saeed news, hafiz saeed not a terrorist, Hafiz Saeed Offers Hurricane Aid, helping is caring, human-rights, lashkar e taiba, muslims, muslims are not terrorists, muslims help others, pakistani leader, pakistani leader reward, pakistani terrorist leader hafiz saeed, politics, prophet mohammed, religion, top five most wanted people on US terror list, worlds most wanted men. You have a very nice site over here. I just wanna thank you for all the interesting information on it. I’ll follow your site if you keep up the good work! I found this weblog very cool and I just wanna say thanks. I hope you keep up the good work!